Netskills, who provide training for Higher Education institutions, have just brought out a series of Guides to emergent technologies and innovative practice entitled Web2practice. For example have a look at this one on microblogging. Lots of useful advice for remote workers. Further topics are planned, including: Social Bookmarking, Blogging, Communications and Digital Identity. I’ve been following a thread on the LIS-BLOGGERS@JISCMAIL.AC.UK list (a discussion list for library and information services bloggers) with interest. The original posting asked about the current use of Twitter by libraries. There have been some useful links to information about which libraries have accounts and how people are using it. However the most interesting thing for me has been an offshoot conversation about blocking of Web sites and Twitter. One person (I won’t mention any names here) responded with a useful link and then went on to explain that this site (a blog – which sounded like a pretty useful site) along with others were blocked during core work hours. Note that the person who made the comment works for a commercial law company. I guess at this point most of the list subscribers who work in academia took a sharp intake of breath. Blocking of sites seems alien to those of us who work in a culture of ‘learning’. However in the not to distant past there have been discussions of IT services blocking use of tools like Skype, though this tends to be more for security and bandwidth reasons. Blocking the Web seems very strange to us academics. Tim Fletcher from Birbeck then pointed out that the blockage of such sites “leaves those of us who are trying use services such as Twitter for perfectly legitimate and appropriate purposes in a difficult position”.He goes on to say that he feels “the difficulty comes when a “social network” tool goes into the mainstream and becomes a business or service network tool and some employers or institutions are not prepared or geared up for that change. It is also a benefit of working in the HE sector and possibly we have a role in trying and testing these things so that colleagues in other sectors can show their employer or institution the benefits, assuming there are some.” Some good points here. The posts reiterate the divide in culture between the academic and the commercial sectors. 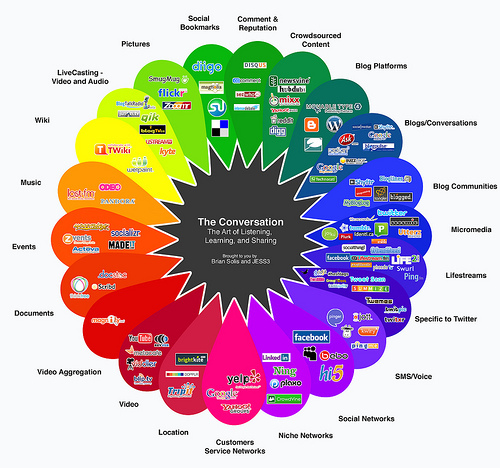 However I think they also show how Web 2.0 technologies have started to bridge this divide. Twitter is now mainstream. Its business uses have been well documented and most forward thinking commercial companies already use it. Even if the bosses are not supportive of the use of certain technologies and sites it seems to me only a matter of time before they succumb. It’s not just about treating your staff as responsible workers but also recognising the current trend in communication. In the meantime those of us who work from home can feel smug that no-one gets to block what we look at. I mentioned a while back that I will be presenting at an online workshop for RSC Eastern on Web 2.0. Bookings for the event have now opened and places are limited so if you are interested please register. In preparation I had my first go at Elluminate Live on Friday. Elluminate is a real-time virtual classroom environment designed for distance education and collaboration in academic institutions and corporate training. It was actually really easy and intuitive to use and pretty good fun. The main areas I tried out are the chat facility, uploading ppts, the whiteboard and presenting web tours. We also had a go at sharing your desktop, though it’s unlikely I’d have to do this at the event. I didn’t get to try out the Webcam, it can be a real bandwidth hog though so probably best to avoid for a big group. I was logged in as a moderator. Our set-up meant that participants used the chat facility most of the time but could select the microphone if they wanted. I think you can restrict use of the microphone – having too many people talk would get confusing. One suggestion was that I set up my laptop too and log in as a participant. This will allow me to see what everyone else is seeing too. I really enjoyed the session. I think as long as people accept that it is still a pretty new way to do things and technologies can need a little bit of tweaking and time, then it can be an invaluable tool. It is possible for the whole of the event to be recorded and shared which is really useful too. For example here is a recent event presented by Ross Gardner from OSS Watch on what open source software is. (Note this links to an actual Elluimate and you will need to download a JNLP file). I’ll post more on Elluminate after I’ve had another go but for now, to be honest, the only complaint I had was that my headphones made my ears hurt!